In astronomy, the word satellite refers to any single object that is orbiting another larger, more massive object under the influence of their mutual gravitational force. system planets that have natural satellites (moons) are Mars (2), Jupiter (28), Saturn (18 known, additional 12 reported), Uranus (21), Neptune (8), and Pluto (1). Artificial satellites are human-made devices that orbit Earth and other celestial bodies. These devices follow the same gravitational laws that govern the orbits of natural satellites. After being launched from Earth, artificial satellites are placed high enough to escape the denser parts of the atmosphere, which would slow down the orbit of the satellite and cause it to plummet to the ground. At the proper height, usually above 200 miles (320 kilometers), artificial satellites stay in orbit around Earth indefinitely. Those placed at this altitude take 90 minutes to circle Earth. The higher the altitude, the slower the satellite's orbit. 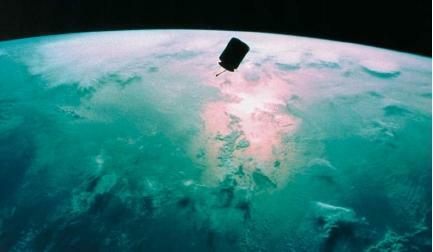 At a height of 22,300 miles (36,000 kilometers), a satellite takes exactly 24 hours to circle Earth. Artificial satellites orbiting Earth have been used to measure everything from the planet's weather to missile launches to the movements of ships. Communications satellites revolve about Earth in orbits 25,000 miles (40,225 kilometers) above the surface. Artificial satellites have also been placed in orbit about the Moon, Mars, and Venus to provide detailed maps of their surfaces and to measure properties of their surrounding atmosphere.